One fine day, a little boy and his sister are about to have breakfast, when they find that there is no milk at home. 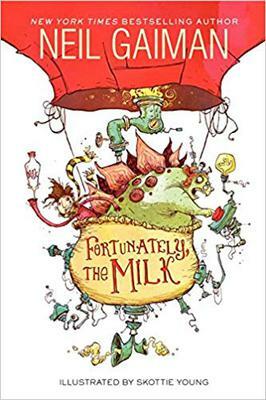 Their mother has gone on a business trip and had warned her husband about the almost empty bottle of milk, who has hitherto ignored the warning. Now the kids are at the breakfast table with no milk for their Toastios and to his utter dismay, no milk for his tea either. So he sets out to the nearest grocery store to buy milk. But it so happens he does not return home for a long long time. The kids, hungry, eat the dry Toastios and wait on their father. When he finally comes back and the kids ask him why he is so late, he spins a wonderful imaginary tale that he was sucked into a spaceship, encountered the aliens, and then fell into a time-space continuum to go back to the 18th century. He lands on a pirate ship and the unfriendly pirates make him walk the plank and were about to feed him to the Piranhas and the sharks. He is rescued by a stegosaurus and his hot-air-balloon-carrier, which is also a time machine. In this carrier, the dad along with the Stegosaurus, who happens to be a renowned scientist, hops back and forth in time, meeting vampires, volcano Gods, aliens, and ponies. And coincidentally, it is the milk, tugged deep in his pocket which always comes to his rescue in every danger he faces. His ardent desire to get milk to his kids on time drives him to battle and persuade everyone whom he meets on the way to get back home. After listening to his long story, the kids finally realize that their father has been making up the whole thing but they enjoy the tale nevertheless. Neil Gaiman spins his magic once again as a master storyteller. Another author in the same league as Roald Dahl, he knows the likes of the children so well. It's a recipe made and presented with their favorite ingredients- Dinosaurs, Pirates, Aliens, Time Machine, Gods and Ponies. Kids will have a blast reading this book, and so will we adults, reading along with them ! !